Debian (play /ˈdɛbiən/) is a computer operating system composed of software packages released as free and open source software primarily under the GNU General Public License along with other free software licenses. Debian GNU/Linux, which includes the GNU OS tools and Linux kernel, is a popular and influential Linux distribution. It is distributed with access to repositories containing thousands of software packages ready for installation and use. Debian is known for relatively strict adherence to the Unix and free software philosophies as well as using collaborative software development and testing processes. Debian can be used on a variety of hardware, from NAS devices to phones, laptops, desktops and servers. It focuses on stability and security and is used as a base for many other distributions. The Debian Project is governed by the Debian Constitution and the Social Contract which set out the governance structure of the project as well as explicitly stating that the goal of the project is the development of a free operating system. Debian is developed by over three thousand volunteers from around the world and supported by donations through several nonprofit organizations around the world. Most important of these is Software in the Public Interest, the owner of the Debian trademark and umbrella organization for various other community free software projects. Thus, the Debian Project is an independent decentralized organization; it is not backed by a company like Linux distributions such as Ubuntu, openSUSE, Fedora, and Mandriva. The cost of developing all the packages included in Debian 5.0 lenny (323 million lines of code), using the COCOMO model, has been estimated to be about US$ 8 billion. Ohloh estimates that the codebase (54 million lines of code), using the COCOMO model, would cost about US$ 1 billion to develop. Debian is known for an abundance of options. The current stable release includes over twenty nine thousand software packages for nine computer architectures using the Linux kernel and two also using the FreeBSD kernel (kfreebsd-i386 and kfreebsd-amd64). These architectures range from the Intel/AMD 32-bit/64-bit architectures commonly found in personal computers to the ARM architecture commonly found in embedded systems and the IBM eServer zSeries mainframes. The Debian standard install makes use of the GNOME desktop environment. It includes popular programs such as OpenOffice.org, Iceweasel (a rebranding of Firefox), Evolution mail, CD/DVD writing programs, music and video players, image viewers and editors, and PDF viewers. There are pre-built CD images for KDE Software Compilation, Xfce and LXDE as well. The remaining discs, which span five DVDs or over thirty CDs, contain all packages currently available and are not necessary for a standard install. Another install method is via a net install CD which is much smaller than a normal install CD/DVD. It contains only the bare essentials needed to start the installer and downloads the packages selected during installation via APT. These CD/DVD images can be freely obtained by web download, BitTorrent, jigdo or buying them from online retailers. Debian was one of the first Linux distributions to compose itself from packages, and robust package management is perhaps Debian's most prominent feature. The APT package management system, repositories with large numbers of packages, and strict policies regarding packages, promote high releases quality, easy upgrades between releases, and automated installation and removal of packages. 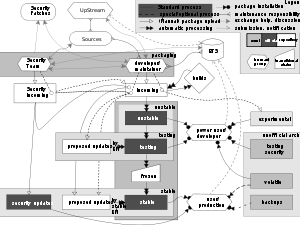 dpkg is the base of the Debian package management system. dpkg is a command-line utility to install, remove, and provide information about local .deb packages. GDebi is a tool that expands the functionality of dpkg by not only installing local .deb packages but also fetching and installing dependencies from online repositories. GDebi can be used both in a graphical interface and by command-line. APT expands the functionality of dpkg by searching, fetching and installing packages from online repositories along with their dependencies, either from binary files or by compiling source code. It can also upgrade packages and upgrade the whole distribution to a new release. Software Center, originally developed for Ubuntu, is a GNOME program to discover and install applications. Synaptic is a GTK+ front-end for APT. KPackage is KDE's front-end for APT. Adept is a discontinued KDE front-end for APT. apt-get is the most basic package management tool and the preferred APT front-end for non-interactive package management. It offers a command line user interface and it is most suitable for upgrades between major releases. aptitude is the most versatile package management tool and the preferred APT front-end for interactive package management. It offers a full screen interactive text user interface, an enhanced package resolver and an enhanced search function. It is most suitable for the daily package management. dselect is an old front-end for APT, largely superseded by other front-ends. wajig is a simplified front end, providing the functionality of apt-get, dpkg, dpkg-deb, apt-cache, and other tools. A Debian Live system is a version of Debian that can be booted directly from removable media (CDs, DVDs, USB keys) or via netboot without having to install it on the hard drive. This allows the user to try out Debian before installing it or use it as a boot-disk. There are prebuilt Debian Live images for rescue, standard, GNOME, KDE Plasma Workspaces, Xfce and LXDE for several architectures. A hard disk installation can be achieved using the Debian Installer included in the live image. Most of the live ISO images for the current Squeeze release no longer fit on a 700MB CD. Customized CD images can be built using live-build. Live-build can not only generate CD Images, but also bootable DVDs, images for USB thumb drives, or netboot images. Live-magic is a GUI for live-build. Ging is a Debian GNU/kFreeBSD Live CD. Recent releases of Debian support an increasing number of ARM-based NAS devices. The cheap NSLU2 was supported by Debian 4.0 and 5.0 and can be upgraded to Debian 6.0 although there are problems with a 6.0 clean install. Debian 5.0 added support for the Buffalo Kurobox Pro, and Debian 6.0 for the SheevaPlug. Other NAS devices supported by Debian, but perhaps not so widely-used by home users, include GLAN Tank and Thecus N2100 as of Debian 4.0, QNAP Turbo Station (TS-109, TS-209, TS-409) and HP mv2120 as of Debian 5.0, and QNAP Turbo NAS TS-11x, TS-21x and TS-41x, OpenRD, Lanner EM7210 and Intel SS4000-e as of Debian 6.0. Debian was first announced on 16 August 1993 by Ian Murdock, who initially called the system "the Debian Linux Release". The word "Debian" was formed as a combination of the first name of his then-girlfriend Debra Lynn and his own first name. Prior to Debian's release, the Softlanding Linux System (SLS) had been the first Linux distribution compiled from various software packages, and was a popular basis for other distributions in 1993-1994. The perceived poor maintenance and prevalence of bugs in SLS motivated Murdock to launch a new distribution. In 1993 Murdock also released the Debian Manifesto, outlining his view for the new operating system. In it he called for the creation of a distribution to be maintained in an open manner, in the spirit of Linux and GNU. The Debian Project grew slowly at first and released the first 0.9x versions in 1994 and 1995. During this time it was sponsored by the Free Software Foundation's GNU Project. The first ports to other, non-i386 architectures began in 1995, and the first 1.x version of Debian was released in 1996. In 1996, Bruce Perens replaced Ian Murdock as the project leader. In the same year, Perens read a discussion between fellow developer Ean Schuessler and Donnie Barnes of Red Hat, suggesting that Red Hat had stated no social contract with its users which guaranteed the future freedom of the system's contents. Perens decided to create a social contract for Debian, created a first draft, and edited suggestions from a month-long the discussion on the Debian mailing lists into the Debian Social Contract and the Debian Free Software Guidelines, defining fundamental commitments for the development of the distribution. He also initiated the creation of the legal umbrella organization, Software in the Public Interest. Perens developed the project from 40 to 200 developers. He broke apart the "base system", the core packages of Debian, which had been maintained by Murdock alone, and distributed them to many maintainers. He led the conversion of the project from a.out to ELF. He created the BusyBox program to make it possible to run a Debian installer on a single floppy, and wrote a new installer. Perens was also responsible for many policy and design elements of Debian that persist to this day. Perens left the project in 1998. The Project elected new leaders and made two more 2.x releases, each including more ports and packages. The Advanced Packaging Tool was deployed during this time and the first port to a non-Linux kernel, Debian GNU/Hurd, was started. The first Linux distributions based on Debian, namely Libranet, Corel Linux and Stormix's Storm Linux, were started in 1999. The 2.2 release in 2000 was dedicated to Joel Klecker, a developer who died of Duchenne muscular dystrophy. In late 2000, the project made major changes to archive and release management, reorganizing software archive processes with new "package pools" and creating a testing distribution as an ongoing, relatively stable staging area for the next release. In the same year, developers began holding an annual conference called DebConf with talks and workshops for developers and technical users. In July 2002, the Project released version 3.0, codenamed woody, (each Debian release is named after a character in the movie Toy Story), a stable release which would see relatively few updates until the following release. The long release cycle employed by the Debian Project during this time drew considerable criticism from the free software community, and this triggered the creation of Ubuntu in 2004, to date one of the most influential Debian forks. The 3.1 sarge release was made in June 2005. There were many major changes in the sarge release, mostly due to the large time it took to freeze and release the distribution. Not only did this release update over 73% of the software shipped in the previous version, but it also included much more software than previous releases, almost doubling in size with more than 9,000 new packages. A new installer replaced the aging boot-floppies installer with a modular design. This allowed advanced installations (with RAID, XFS and LVM support) including hardware detection, making installations easier for novice users. The installation system also boasted full internationalization support as the software was translated into almost forty languages. An installation manual and comprehensive release notes were released in ten and fifteen different languages respectively. This release included the efforts of the Debian-Edu/Skolelinux, Debian-Med and Debian-Accessibility sub-projects which boosted the number of educational packages and those with a medical affiliation as well as packages designed especially for people with disabilities. In 2006, as a result of a much-publicized dispute, Mozilla software was rebranded in Debian, with Firefox becoming Iceweasel, Thunderbird becoming Icedove, along with other Mozilla programs. The Mozilla Corporation stated that Debian may not use the Firefox trademark if it distributes Firefox with modifications which have not been approved by the Mozilla Corporation. Two prominent reasons that Debian modifies the Firefox software are to change the artwork, and to provide security patches. Debian Free Software Guidelines consider Mozilla's artwork non-free. Debian provides long term support for older versions of Firefox in the stable release, where Mozilla prefers that old versions are not supported. The software programs developed largely by the Mozilla Corporation were rebranded but the programs' source codes remained the same only with minor differences. Debian 4.0 (etch) was released April 8, 2007 for the same number of architectures as in sarge. It included the AMD64 port but dropped support for m68k. The m68k port was, however, still available in the unstable distribution. There were approximately 18,200 binary packages maintained by more than 1,030 Debian developers. 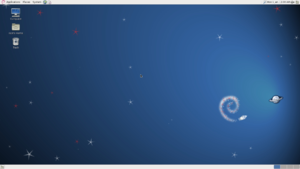 Debian 5.0 (lenny) was released February 14, 2009 after 22 months of development. It includes more than 25,000 software packages. Support was added for Marvell's Orion platform and for netbooks such as the Asus Eee PC. The release was dedicated to Thiemo Seufer, an active developer and member of the community who died in a car accident on December 26, 2008. 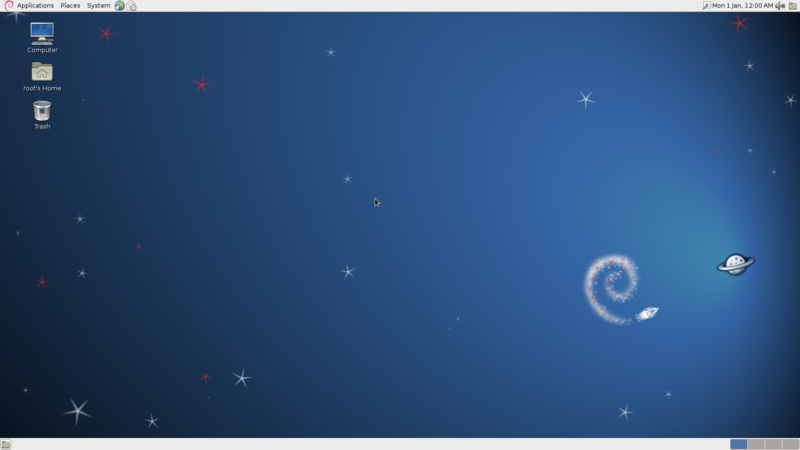 On September 5, 2010, Debian officially acquired the backports service, which provides more recent versions of some software for the stable release of Debian. Debian 6.0 (squeeze) was released February 6, 2011 after 24 months of development. For the first time, Debian GNU/kFreeBSD was introduced with this version as a technology preview. The Debian Free Software Guidelines define the criteria for "free software" and thus what software is permissible in the distribution, as referenced in the Social Contract. These guidelines have also been adopted as the basis of the Open Source Definition. Although it can be considered a separate document for all practical purposes, it formally is part of the Social Contract. The Debian Constitution describes the organizational structure for formal decision-making within the Project, and enumerates the powers and responsibilities of the Debian Project Leader, the Debian Project Secretary, and the Debian Developers generally. Currently, the project includes more than a thousand developers. Each of them sustains some niche in the project, be it package maintenance, software documentation, maintaining the project infrastructure, quality assurance, or release coordination. Package maintainers have jurisdiction over their own packages, although packages are increasingly co-maintained. Other tasks are usually handled by the domain of smaller, more collaborative groups of developers. The project maintains official mailing lists and conferences for communication and coordination between developers. For issues with single packages or domains, a public bug tracking system is used by developers and end-users. Informally, Internet Relay Chat channels (primarily on the OFTC and freenode networks) are used for communication among developers and users as well. Together, the Developers may make binding general decisions by way of a General Resolution or election. All voting is conducted by Cloneproof Schwartz Sequential Dropping, a Condorcet method of voting. A Project Leader is elected once per year by a vote of the Developers; in April 2010, Stefano Zacchiroli was voted into this position, succeeding Steve McIntyre. The Debian Project Leader has several special powers, but this power is far from absolute and is rarely used. Under a General Resolution, the Developers may, among other things, recall the leader, reverse a decision by him or his delegates, and amend the constitution and other foundational documents. The Leader sometimes delegates authority to other developers in order for them to perform specialized tasks. Generally this means that a leader delegates someone to start a new group for a new task, and gradually a team gets formed that carries on doing the work and regularly expands or reduces their ranks as they think is best and as the circumstances allow. A role in Debian with a similar importance to the Project Leader's is that of a Release Manager. Release Managers set goals for the next release, supervise the processes, and make the final decision as to when to release. A supplemental position, Debian Second in Charge (2IC), was created by Anthony Towns. Steve McIntyre held the position between April 2006 and April 2007. From April 2009 to April 2010 this position was held by Luk Claes. Stefano Zacchiroli — the current project leader — abandoned this unofficial position when being elected in April 2010. Note that this list includes the active release managers; it does not include the release assistants (first introduced in 2003) and the retiring managers ("release wizards"). The Debian project has a steady influx of applicants wishing to become developers. These applicants must undergo an elaborate vetting process which establishes their identity, motivation, understanding of the project's goals (embodied in the Social Contract), and technical competence. Debian Developers may resign their positions at any time by orphaning the packages they were responsible for and sending a notice to the developers and the keyring maintainer (so that their upload authorization can be revoked). After a version of a software package has remained in unstable for a certain length of time (depending on the urgency of the software's changes), that package is automatically migrated to the testing distribution. The package's migration to testing occurs only if no serious (release-critical) bugs in the package are reported and if other software needed for package functionality qualifies for inclusion in testing. Since updates to Debian software packages between official releases do not contain new features, some choose to use the testing and unstable distributions for their newer packages. However, these distributions are less tested than stable, and unstable does not receive timely security updates. In particular, incautious upgrades to working unstable packages can sometimes seriously break software functionality. Since September 9, 2005 the testing distribution's security updates have been provided by the testing security team. After the packages in testing have matured and the goals for the next release are met, the testing distribution becomes the next stable release. The timing of the release is decided by the Release Managers, and in the past the exact date was rarely announced earlier than a couple of weeks beforehand. Each Debian software package has a maintainer who keeps track of releases by the "upstream" authors of the software and ensures that the package is compliant with Debian Policy, coheres with the rest of the distribution, and meets the standards of quality of Debian. In relations with users and other developers, the maintainer uses the bug tracking system to follow up on bug reports and fix bugs. Typically, there is only one maintainer for a single package, but, increasingly, small teams of developers "co-maintain" larger and more complex packages and groups of packages. Periodically, a package maintainer makes a release of a package by uploading it to the "incoming" directory of the Debian package archive (or an "upload queue" which periodically batch-transmits packages to the incoming directory). Package uploads are automatically processed to ensure that they are well-formed (all the requisite files are in place) and that the package is digitally signed by a Debian developer using OpenPGP-compatible software. All Debian developers have individual cryptographic key pairs. Packages are signed to be able to reject uploads from hostile outsiders to the project, and to permit accountability in the event that a package contains a serious bug, a violation of policy, or malicious code. If the package in incoming is found to be validly signed and well-formed, it is installed into the archive into an area called the "pool" and distributed every day to hundreds of mirrors worldwide. Initially, all package uploads accepted into the archive are only available in the "unstable" suite of packages, which contains the most up-to-date version of each package. It must not have a greater number of "release-critical" bugs filed against it than the current version in testing. Release-critical bugs are those bugs which are considered serious enough that they make the package unsuitable for release. All of its dependencies must either be satisfiable by packages already in testing, or be satisfiable by the group of packages which are going to be installed at the same time. The operation of installing the package into testing must not break any packages currently in testing. Thus, a release-critical bug in a package on which many packages depend, such as a shared library, may prevent many packages from entering the testing area, because that library is considered deficient. Periodically, the Release Manager publishes guidelines to the developers in order to ready the release, and in accordance with them eventually decides to make a release. This occurs when all important software is reasonably up-to-date in the release-candidate suite for all architectures for which a release is planned, and when any other goals set by the Release Manager have been met. At that time, all packages in the release-candidate suite ("testing") become part of the released suite ("stable"). It is possible for a package: particularly an old, stable, and seldom-updated one: to belong to more than one suite at the same time. The suites are simply collections of pointers into the package "pool" mentioned above. The Debian Project, being free software, handles security policy through public disclosure rather than through security through obscurity. Many advisories are coordinated with other free software vendors (Debian is a member of vendor-sec) and are published the same day a vulnerability is made public. Debian has a security audit team that reviews the archive looking for new or unfixed security bugs. Debian also participates in security standardization efforts: the Debian security advisories are compatible with the Common Vulnerabilities and Exposures (CVE) dictionary, and Debian is represented in the Board of the Open Vulnerability and Assessment Language (OVAL) project. The Debian Project offers extensive documentation and tools to harden a Debian installation both manually and automatically. 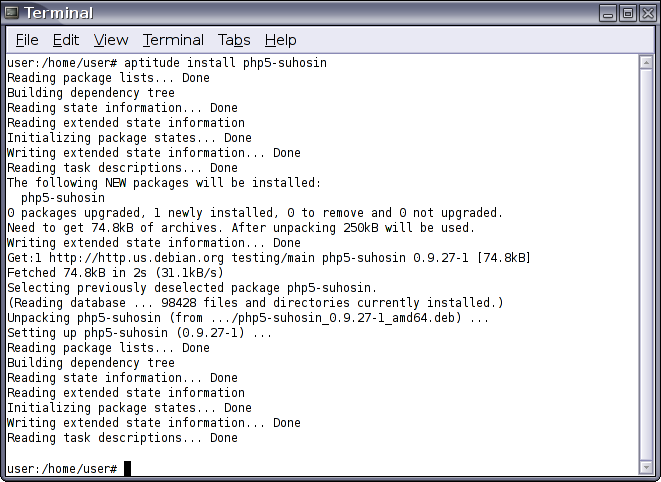 SELinux (Security-Enhanced Linux) packages are installed by default though not enabled. Debian provides an optional hardening wrapper but does not compile their packages by default using gcc features such as PIE and Buffer overflow protection to harden their software, unlike Ubuntu, Fedora and Hardened Gentoo among others. These extra features greatly increase security at the performance expense of 1% in 32 bit and 0.01% in 64 bit. As of February 2011, the latest stable release is version 6.0, code name squeeze. When a new version is released, the previous stable version becomes oldstable; currently version 5.0, code name lenny. In addition, a stable release gets minor updates (called point releases). The numbering scheme for the point releases up to Debian 4.0 was to include the letter r (for release) after the main version number (e.g. 4.0) and then the number of the point release; for example, the latest point release of version 4.0 (etch) as of 8 December 2010 is 4.0r9. From Debian 5.0 (lenny), the numbering scheme of point releases has been changed and conforms to the GNU version numbering standard; so, for example, the first point release of Debian 5.0 was 5.0.1 (instead of 5.0r1). The Debian security team releases security updates for the latest stable major release, as well as for the previous stable release for one year. 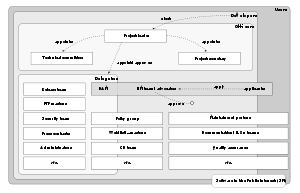 Version 4.0 etch was released on 8 April 2007, and the security team supported version 3.1 Sarge until 21 March 2008. For most uses it is strongly recommended to run a system which receives security updates. The testing distribution also receives security updates, but not in as timely a manner as stable. 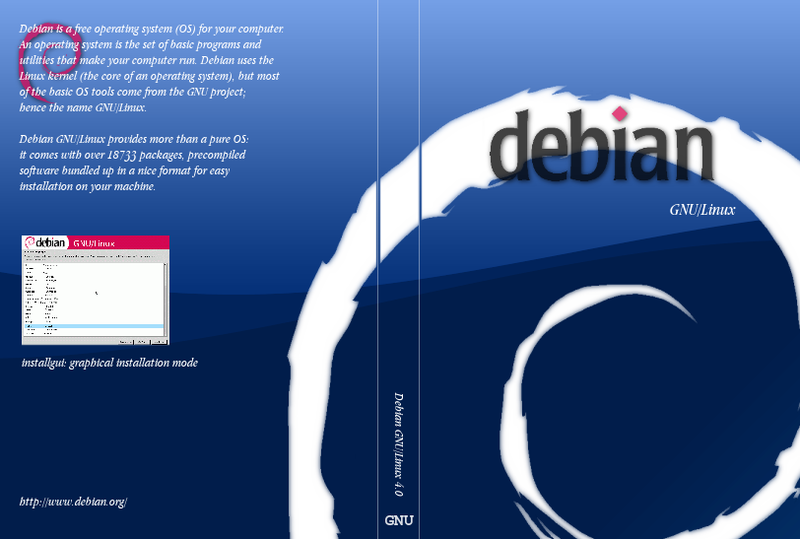 For Debian 6.0 (squeeze) a new policy of time-based development freezes on a two-year cycle was announced. Time-based freezes are intended to allow the Debian Project to blend the predictability of time based releases with its policy of feature based releases. The new freeze policy aims to provide better predictability of releases for users of the Debian distribution, and to allow Debian developers to do better long-term planning. Debian developers expect that a two-year release cycle will give more time for disruptive changes, reducing inconveniences caused for users. Having predictable freezes was expected to reduce overall freeze time. The squeeze cycle was intended to be especially short to "get into the new cycle". However this short freeze cycle for squeeze was abandoned. The code names of Debian releases are names of characters from the film Toy Story. The unstable, development distribution is permanently nicknamed sid, after the emotionally unstable next-door neighbor boy who regularly destroyed toys. The release after squeeze will be named wheezy, after the rubber toy penguin in Toy Story 2. TBA stands for to be announced. 3.1 sarge 6 June 2005 11 ≈ 15,400 2008-04 Modular installer, semi-official amd64 support. 5.0 lenny 14 February 2009 11+1(A) ≈ 23,000 TBA New architecture/binary ABI: armel. SPARC 32-bit hardware support dropped. Full Eee PC support. Latest update 5.0.9 was released 2011-10-01. 6.0 squeeze 6 February 2011 9+2(B) ≈ 29,000 TBA New architectures/kernels: kfreebsd-i386, kfreebsd-amd64, dropped architectures: alpha, hppa, OABI arm. eglibc instead of glibc. Dependency-based boot sequence, which allows for parallel init script processing. Remove old libraries such as GTK 1. Default Linux kernel purged of non-free firmware. 7.0 wheezy ca. 2013 TBA TBA TBA Remove old libraries such as Qt3. Introduce multiarch support. Due to an incident involving a CD vendor who made an unofficial and broken release labeled 1.0, an official 1.0 release was never made. The Debian Project offers three distributions, each with different characteristics. The distributions include packages which comply with the Debian Free Software Guidelines (DFSG), which are included inside the main repositories. stable, currently aliased squeeze, is the current release that has stable and well-tested software. Stable is made by freezing testing for a few months where bugs are fixed to make the distribution as stable as possible; then the resulting system is released as stable. It is updated only if major security or usability fixes are incorporated. 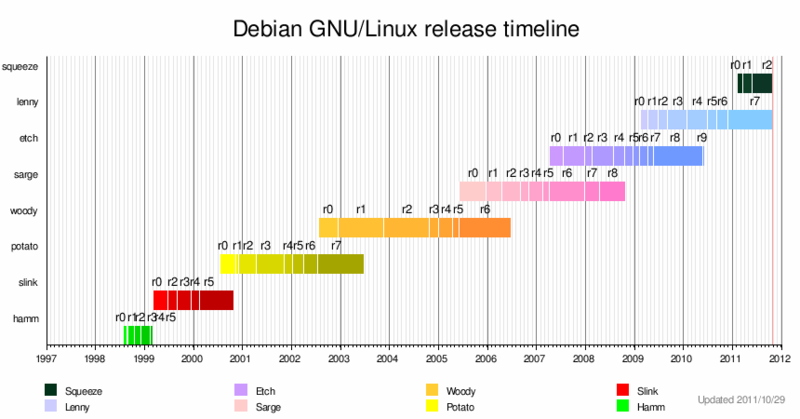 After Debian 6.0, new releases will be made every two years. Stable's CDs and DVDs can be found in the Debian web site. testing, currently aliased wheezy, is what the next major release will be and is currently being tested. The packages included in this distribution have had some testing in unstable but they may not be completely fit for release yet. It contains more modern packages than stable but older than unstable. This distribution is updated continually until it enters the "frozen" state. Security updates for testing distribution are provided by Debian testing security team. Testing's CDs and DVDs can be found on the Debian web site. unstable, permanently aliased sid, repository contains packages currently under development; it is updated continually. This repository is designed for Debian developers who participate in a project and need the latest libraries available, or for those who like to "live on the edge", therefore it will not be as stable as the other distributions. There are no official CDs/DVDs because it is rapidly changing and the project does not support it, although CD and DVD images of sid are built quarterly by aptosid. Additionally, the other two distributions can be upgraded to unstable. The Debian Free Software Guidelines (DFSG) adhere to a relatively strict interpretation of free and open source software (FOSS), although it is still not endorsed by the Free Software Foundation as it includes and supports a proprietary repository, documentation that recommends non-free software and includes binary blobs. In accordance with its guidelines, a relatively small number of packages are excluded from the distributions' main repositories and included inside the non-free and contrib repositories. These two repositories are not officially part of Debian GNU/Linux. non-free: repositories include packages which do not comply with the DFSG (this does usually not include legally questionable packages, like libdvdcss). contrib: repositories include packages which do comply with the DFSG, but may fail other requirements. For instance, they may depend on packages which are in non-free or requires such for building them. experimental: is not actually a full (self-contained) development distribution, it is meant to be a temporary staging area for highly experimental software. Dependencies missing are most likely found in unstable. Debian warns that these packages are likely unstable or buggy and are to be used at the user's own risk. backports: This repository provides more recent versions than stable for some software. It is mainly intended for users of stable who need a newer version of a particular package. oldstable, presently aliased lenny, is the previous stable release. It is supported until 1 year after a new stable is released. Debian recommends to update to the new stable once it has been released. snapshot: The snapshot repositories provide older versions of other repositories. They may be used to install a specific older version of some software. These repositories are not part of the Debian Project, they are maintained by third party organizations. They contain packages that are either more modern than the ones found in stable or include packages that are not included in the Debian Project for a variety of reasons such as: e.g. alleged possible patent infringement, binary-only/no sources, or special too restrictive licenses. Their use requires precise configuration of the priority of the repositories to be merged; otherwise these packages may not integrate correctly into the system, and may cause problems upgrading or conflicts between packages from different sources. The Debian Project discourages the use of these repositories as they are not part of the project. Debian has no hardware requirements beyond those of the Linux kernel and the GNU tool-sets (gcc, coreutils, bash, etc.). Therefore, any architecture or platform to which these packages have been ported, and for which a Debian port exists, can run Debian. Linux, and therefore Debian, supports many processors or "symmetric multiprocessing". This does not inhibit support for single-processor systems. A 1 GHz processor is the minimum recommended for desktop systems. The real minimum memory requirements are much less than the numbers listed in this table. Depending on the architecture, it is possible to install Debian with as little as 20 MB for s390 or 48 MB for i386 and amd64. Similarly, disk space requirements, which depend on the packages to be installed, can also be reduced. It is possible to run graphical user interfaces on older or low-end systems, but it is recommended to install window managers instead of desktop environments, which are more resource-intensive. For example, the LXDE desktop environment was released with lenny and has much lower processor and memory usages compared with GNOME or KDE Plasma Desktop. Depending on the nature of the server, RAM and disk space requirements can vary widely. The m68k port was the second official one in Debian, and has been part of five stable Debian releases. Due to its failure to meet the release criteria, it was dropped before the release of etch. The OABI arm as well as alpha and hppa were dropped before the release of squeeze. Many distributions have chosen to extend Debian based on the different distributions Debian offers. Debian was ranked second only to Ubuntu (which is itself derived from Debian) for Most Used Linux Distribution for both Personal and Organizational use in a 2007 survey by SurveyMonkey.com. Debian won the 2007 poll on Server Distribution of the Year by LinuxQuestions.org. Both the Debian distribution and their website have won various awards from different organizations. Debian was awarded the 2004 Readers' Choice Award for Favorite Linux Distribution by the Linux Journal. A total of fifteen other awards have been awarded throughout Debian's lifetime including Best Linux Distribution. Debian has also received negative assessments. In May 2008, a Debian Developer revealed his discovery that changes made in 2006 to the random number generator in the version of the openSSL package distributed with Debian and other Debian-based distributions such as Ubuntu or Knoppix, made a variety of security keys vulnerable to a random number generator attack. The security weakness was caused by changes made to the openssl code by another Debian Developer in response to memory debugger warnings. The security hole was soon patched by Debian and others, but the complete resolution procedure was cumbersome for users because it involved regenerating all affected keys, and it drew criticism to Debian's practice of making Debian-specific changes to software. Richard Stallman and the Free Software Foundation (FSF) have criticized the Debian Project for providing the non-free repository, rather than excluding this type of software entirely, an opinion also echoed by some in Debian including the then-Project Leader Wichert Akkerman. The internal dissent in the Debian Project regarding the non-free section has persisted, but the last time it came to a vote in 2006, a large majority decided to keep it. During the release cycles of Woody and Sarge, the Debian Project drew considerable criticism from the free software community because of the extended period between stable releases. This triggered the creation of Ubuntu in 2004. Ubuntu has releases every 6 months which are forks of Debian's unstable distribution with bug fixes and other modifications. However, it may be more appropriate to compare Debian releases (which continue to be supported after the release of subsequent versions) to Ubuntu's Long Term Support releases (which are supported for three years for desktops and five years for servers); Ubuntu produces a new LTS release every two years, which is therefore similar to Debian's new two-year release cycle for post-Debian 6.0 releases. When in need of updated versions of software, it is possible to use Debian testing instead of stable as it usually contains more modern, though slightly less stable packages. Another alternative is to use Debian backports, which are "recompiled packages from testing (mostly) and unstable (in a few cases only, e.g. security updates), so they will run without new libraries (wherever it is possible) on a stable Debian distribution".